MTG Commander/Elder Dragon Highlander • View topic - Why Isn't There an Official 100 Life Cap Rule for Commander? Why Isn't There an Official 100 Life Cap Rule for Commander? Post subject: Why Isn't There an Official 100 Life Cap Rule for Commander? I discussed this topic last weekend with a friend of mine while I was playtesting Firesong and Sunspeaker gaining tons of life off of the damage that I've been dealing and I asked him If it was okay to stay at 100 life. I remember running into a similar problem awhile back when I was playing an Azorius Storm Herd Urzatron build when the first Ravnica block was released. My friend decided against it and suggested that I go past 100 life even though it made more sense to stay at 100 life since for me it's much easier to calculate life loss and life gain that way. I'm fully aware of where the official judges stand in regards to this since gaining infinite life is supposed to be a set number. The problem with choosing a set number is that it makes games too one sided. I figured If there was an official 100 life cap rule for the format then games wouldn't take forever, sure there's ways to get around it with Tainted Remedy and False Cure but what If nobody within your playgroup is running Black in their color identity for those cards? Wouldn't that be a problem for decks that are unable to deal with life gain in Commander? Poison is an alternative sure but what else? Post subject: Re: Why Isn't There an Official 100 Life Cap Rule for Commander? 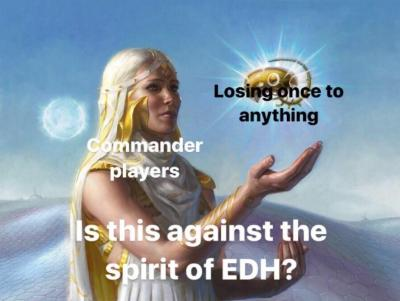 The format also has Commander damage as an alternate win condition. Besides that a table can generally work together to get a player with lots or even "infinite" life under control (maybe your Commander isn't that good at dealing 21 damage, but somebody's bound to be). I disagree with the concept. Life is a resource that White and Green generate willy-nilly, but in EDH, there are pieces in every color, that synergize for well over 40+ damage in fair decks, and they tend to stack up rather quickly. Lifegain is generally considered a weak strategy because of that- and if your opponents cannot overcome the amount of life gained- they'll generally be wise enough not to play it out. With F&S though, that's sortof the point- your lifegain spells generate Volcanic Hammers, and the lifegain you get from red spells helps pad out your lifetotal to handle taking ludicrous amounts of damage. Cards like Storm Herd, Archangel of Thune, Serra Avatar etc. are just the payoffs for floating a high life total- and are naturally countered considerably often- while Treasonous Ogre gives you the ability to consume the resource for considerable acceleration. F&S also permit you to play spells that burn all players (including yourself) quite liberally with the downside negated, or cards like Volcano Hellion to greater effect. There is a limit on deck size and singletons, but that's because those restrictions are defining characteristics of EDH. Life doesn't have a limit because the base game doesn't give it one and the format doesn't inherently need to give it one. Yeah, I've got to say that if lifegain is what's breaking your meta, you should be happy. Infinite turns, soft- and hard-locks, infinite swarm, "I play solitaire until you all die", and similar decks are much much more oppressive. If you run into one of those decks, and don't have a counter at the right time, you typically get to stare at the board and be able to do nothing about it. At least with infinite life, even if you have no infinite damage option in your deck, you've still got the possibility of commander damage and deck out to win. If you want to give your commander a better chance to do the damage, you can always throw in Rogue's Passage, Trailblazer's Boots and Whispersilk Cloak. Also, if infinite/absurdly high life totals really are the problem, Inkmoth Nexus is legal in every deck and barely even costs a deck slot. Along with the aforementioned infect and commander damage, you can also consider some other alternate win-cons. There are ways to win a game without any damage at all. Mill is one such example, but you can also use door to nothingness to make that player lose, or create a biovisionary, azors elocutors or approach of the second sun deck. If you go that route, just build a Skittles deck to prove your point. Or any Voltron deck. I'm all for Voltron. My Thrun deck is a lot of fun (although I notice that post needs a serious update). You left out the best red card... Heartless Hidetsugu! You left out the best red card... Heartless Hidetsugu Repercussion! Surprised Quietus Spike and Sword of War and Peace haven't come up. Not usually a fan of most equipment- but these two are exceptional at taking the scalpel to high lifegain strategies. Quietus Spike also has a mirror in Scytheclaw. Connect with both for extra fun! Quietus Spike was mentioned. In the post I quoted. Also, new Virtus the Velied. Many modern/recent digital CGs do install hard caps to to limit game scope. Hearthstone, Shadowverse, that-one-game-that-no-one-talks-about, all use caps to keep certain abilities in check. Priest with no health max would be insanity, Forestcraft can generate ludicrous 1/1s really easy but only 5 can be in play at once. The amount of maintenance and memory demand in magic is very high. I enjoy nested algebra, multi-million creature combat, and tracking trigger compiling/sequence vulnerability, but I get why lots of people don't. Without shortcuts or players trusting outcome explanations my favorite decks would be torturously time consuming, it's why I have VERY different MTGO commander decks and paper decks (Presence of Gond + Midnight Guard lethal takes 5 seconds in person and 10 minutes online). It seems like Card Slinger is more concerned with game prolongment than balance. Things you can do to shorten games? Remember, if you lose faster you get more opportunities to win! once you can do non-infinite amounts of damage that involve scientific notation, you realize life totals are irrelevant.